Nestldown in Los Gatos, California, is an absolutely stunning place to have a wedding ceremony. The grounds are crazy beautiful, and the greenery just goes forever. I met this cute couple while I was photographing a medical mission in Bohol, Philippines. A few years later, I got a call asking if I could shoot their wedding in Northern California (they actually lived in Boston at the time). I was so happy that this couple even involved me in choosing their location. They sent me three different web sites of locations they were considering and asked which location I thought would be better for photos. I had never seen or heard of any of the locations, but after looking at the photos on their web sites, and elsewhere on the web, I told them there was no other choice: They simply had to get married at Nestldown. At the time, it wasn't their first choice. But they later told me that everything was perfect, and that they couldn't have imagined getting married anywhere else. I love emotional brides, and this bride did not disappoint. 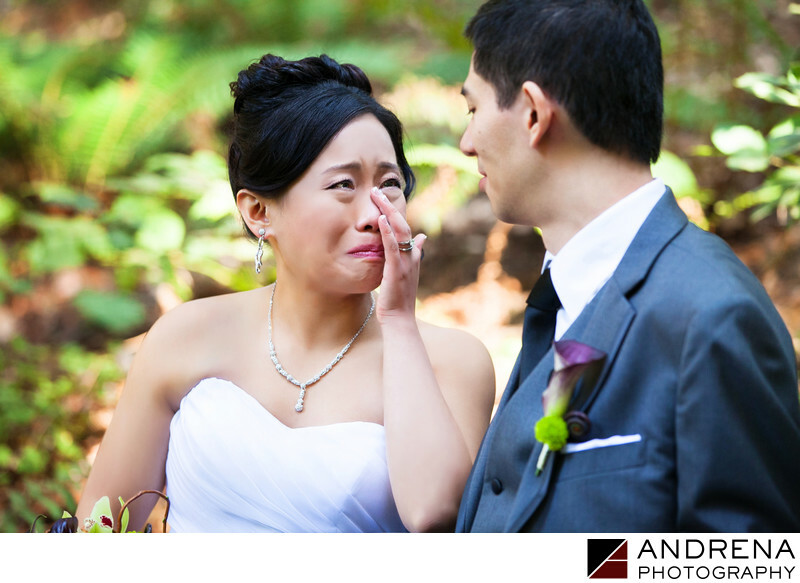 This crying moment was captured shortly after their wedding ceremony, during a quiet, private moment. This is just one of four photographs of the bride breaking down and crying with joy after she married the love of her life. Wedding photographed at Nestldown, Los Gatos, California.